On May 6, 2005, Shoreh Elhami traveled to Kabul, Afghanistan, as a GISCorps volunteer. As the plane flew over the Hindu kush at an average altitude of 5,000 meters, the vastness and beauty of Afghanistan's magnificent mountains amazed her. Later on, as she became acquainted with the Afghans, she found herself equally impressed by their kindness, sense of humor, and hospitality. Shoreh Elhami giving a lecture to AIMS Staff. This was mainly a fact-finding mission and consisted of a series of meetings, lectures, and technical workshops. Her host was the Afghanistan Information Management Service (AIMS) agency, a joint venture between the United Nations Development Programme and the United Nations Office for the Coordination of Humanitarian Affairs. The goal was to learn about AIMS' GIS capabilities, identify the agency's needs, then deploy the most qualified volunteers to assist with those needs. AIMS has two primary responsibilities: building information management capacity in government and delivering information management services, including GIS services, to organizations across Afghanistan (www.aims.org.af). The AIMS GIS division has been in operation for several years and provides a variety of GIS services to government agencies, such as the Afghanistan Geodesy and Cadastral Head Office (AGCHO), Central Statistics Office (CSO), and Ministry of Rural Rehabilitation and Development. AIMS services include but are not limited to database creation (both spatial and nonspatial), training, mapping, and project management. During her visit, Elhami met with several AIMS staff members from various divisions and learned about their current and future projects, as well as their GIS needs and challenges. She was also able to examine some of their datasets and observe their data-gathering methodologies. In addition to meeting with the staff, she gave several lectures on topics such as the GISCorps and its mission, cadastral mapping, and spatial modeling. AIMS staff and several elected officials from Kabul municipality and various ministries attended those lectures. On one occasion and only 15 minutes prior to the presentation, she was asked to deliver her lecture on cadastral mapping in Farsi (similar to the Dari language)! With AIMS Staff at a hands-on workshop. The AIMS GIS system is entirely Esri software-based. AIMS had a combination of ArcView 3.x and 9.x licenses in its main office, as well as its satellite offices. The majority of AIMS projects were still in the ArcView 3.x environment. However, the agency had started migrating several of those projects to the 9.0 environment. Even though some of the staff had taken courses from Esri's Virtual Campus, they were very interested in taking the instructor-led course as well; Elhami ended up teaching 26 AIMS and non-AIMS employees. While the majority of students were from the Kabul branch of AIMS, a number of them had come from other AIMS offices, such as Herat, Jalalabad, and Mazar-e-Sharif. Non-AIMS students were from the United States Agency for International Development. At the end of these workshops, Elhami was most impressed and inspired by the students' GIS capabilities and enthusiasm to learn. After meeting with various groups and discussing their projects and needs, Elhami wrote a preliminary report with her observations, recommendations, and a list of projects requested by AIMS and other entities. AIMS requests for the volunteers are of two types. The first type mainly consists of hands-on software training. AIMS has decided to migrate its current GIS to an enterprise system (an ArcSDE/SQL Server-based system), and the agency is interested in trainers who can help achieve that goal. Furthermore, since one of AIMS' main objectives is data sharing and distribution, it also needs training on how to set up and design a Web-based interactive map server application using ArcIMS. The second type includes several requests for technical assistance in areas such as data collection methodologies (including mobile data collection), disaster management applications, data conversion, and geodatabase design. CSO and AGCHO are also interested in using GISCorps volunteers for their projects. CSO is embarking upon a new project to assist it with Afghanistan's upcoming census and is looking for volunteers with expertise in census-related datasets and applications. CSO is especially interested in working with GISCorps volunteers and conducting a pilot project on real-time field data collection methodologies. AGCHO is looking into the best practices for building a nationwide cadastral system and is interested in working with GISCorps volunteers with expertise in cadastral mapping. 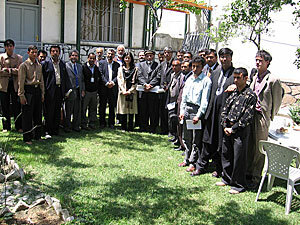 Elhami also visited with the faculty of Kabul University's departments of Geology and Geography. Currently, neither department offers any GIS courses, and each still uses old textbooks and materials. However, they were quite eager to incorporate GIS into their existing curriculum. They were also very interested in GIS materials and any standards and/or literature in Farsi. While there, Elhami ended up giving her second lecture in Farsi. With Kabul municipality and several ministries' staff and elected officials. A week later, Elhami gave a lecture at K.N. 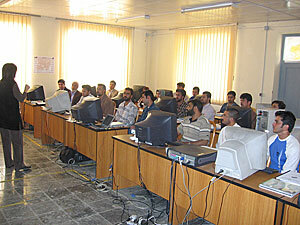 Toosi University of Technology (KNTU) in Tehran about GISCorps and cadastral mapping. After the lecture, the students demonstrated some of their ongoing GIS projects, which were quite impressive. KNTU offers undergraduate as well as master's and Ph.D. degrees in remote sensing, surveying, and GIS. She asked the faculty if they would be willing to assist Kabul University in getting a GIS program started, and a number of them expressed interest in helping Kabul University by sending trainers there and/or hosting its faculty at KNTU. Shortly after she returned, Elhami finalized the preliminary report and sent it to AIMS staff. Overall, she identified nine potential projects for GISCorps volunteers. While some of these projects require that the volunteer(s) be deployed to Afghanistan, at least three of them could be implemented remotely by volunteers from their home countries. 2005 was a rewarding year for GISCorps volunteers and committee members. Following the Indian Ocean tragedy of December 2004, more than a dozen GISCorps volunteers were either deployed to the region or worked remotely on postdisaster relief projects. Their stories and what they were able to accomplish is a true display of their selflessness and compassion. As enthusiastic as Elhami felt about GISCorps volunteers and their accomplishments, this sentiment was not fully realized until she became a volunteer herself. In Afghanistan, she met the most remarkable group of people and was deeply inspired by their resilience and desire to make a difference. Afghanistan needs the assistance of GIS professionals in building a nationwide spatial data infrastructure, and GISCorps volunteers could assist in achieving that goal. She is convinced that by volunteering, GIS professionals can make a difference. For more information, contact Shoreh Elhami, URISA's GISCorps cofounder and chairperson. For more information about GISCorps, visit www.giscorps.org and www.urisa.org. GISCorps operates under the auspices of the Urban and Regional Information Systems Association (URISA).